How do you make a great book even better? 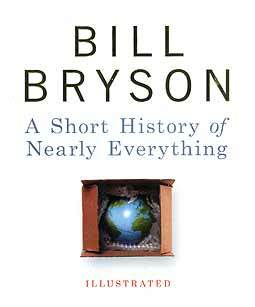 If it is Bill Bryson’s A Short History of Nearly Everything, (ISBN 0-385-60961-2, Doubleday Books), you publish it in hard cover! I reviewed the paperback version two years ago, and make no apologies for reviewing it a second time. I described it as the most readable ‘science’ textbook, and now in hard cover it will stand the test of time, so that you and your children can read it. Bryson divides the illustrated contents into six broad areas, the solar system, measurement parameters, the new age, atomic concepts, life itself and finally the evolution of mankind. He mentions an engineer called Thomas Midgely Jnr who was the one to introduce tetraethyl lead (TEL) into gasoline, in the early pre-NIOSH or OSHA days, with catastrophic results to worker health. Bryson goes on to write, “With an instinct for the regrettable, that was almost uncanny, he (Midgely) invented chlorofluorocarbons, or CFC’s.” One of the prime reasons the world is battling to patch up the hole in the ozone layer. Bryson has a wonderfully irreverent way of looking at things (“nearly everything”), even pontificating as to the spread of syphilis in a monastery in Hull or telling the reader about the Geology professor who had to run a curio shop to keep bread on the family table, while he continued, unfunded, to work out a method to date rocks. Pick up the book and open anywhere and you will be amused, entertained and edified. You will read about Clair Patterson (a man) who proved that atmospheric lead dated back to Midgely and his TEL, but whose work was ignored and suppressed by the powerful petroleum lobby. Industrial intrigue at its best. Bryson will introduce you to the neutrino, a tiny, almost devoid of mass, particle, of which ten thousand trillion trillion pass through the earth every second. They pass through you and me as if we do not exist, and indeed if there were a body made up of neutrinos, it and us could co-exist without being aware of each other’s presence. Life as we know it, or as we presume it, is looked at, with more than a passing reference to the (now superseded) Genome Project, which has spawned the Proteome Project. This is the short history of the essentials of life brought right to the minute, in all its complexity, yet described with ultimate clarity. This is in many ways the beauty of this book. Bryson explains the unfathomable in terms that the layman uses and understands. If you have the smallest spark of interest in how we (homo sapiens) got here, or how ‘here’ evolved into what it is today, then this book is for you. Bryson makes even the driest subjects enthralling. He devoted three years of his life to do this. It is worth a few days of yours to read it. The review copy was made available by Bookazine and had an RRP of 1550 baht. Expensive I know, but worth every baht for a lifetime of information. Buy it for your children. Without any shadow of a doubt this is the best concert DVD I have ever seen. This from a person who loves music on DVD as you can watch the bits you want and listen to the bits when your attention wanders. This DVD though will not allow your attention to wander, in fact I have had to turn it off so I can concentrate on writing this homage. After reaching great success in the early 1970s, followed by some rather dodgy efforts in the mid 1970s, Jonathan Kelly could see what the world of Rock ‘n’ Roll was doing to his life and simply turned away from it - no great retirement speeches or farewell tours, Jonathan Kelly simply pulled his new family together and went and created a new life for himself in Wales. It became one of the great unsolved mysteries of rock music: ‘What happened to Jonathan Kelly’. Those first two RCA records and the various concert appearances had left a strong impression in many music lovers’ minds. So much so in fact that Gerald Sables and the intrepid Rosy made it their quest to go out and find the elusive musician. Not only did they find him in the year 2000, but like in all good stories they became friends with Jonathan Kelly, his wife and family. But still Jonathan Kelly was very loathe to make any return to the music scene. But now for the present and future. Gerald Stables’ mother had a frightening clash with the dreaded cancer. Fortunately she fought it and won, recovering full health. Gerald decided to give something back, organizing a concert in a local Darlington folk club to raise money for the ‘Fight The Cancer Fund’. Gerald asked his new friend Jonathan Kelly if he would possibly sing a song or two, and to Gerald’s amazement Jonathan Kelly agreed to headline the show. As soon as it was announced that Jonathan Kelly would be playing his first show in nearly thirty years the club sold out in hours with people coming from all over Britain and some even taking the journey over from Europe. The audience experienced the concert of a lifetime. 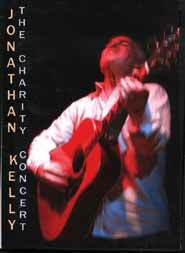 Even though Jonathan Kelly had not played a public concert in thirty years, he was there ready with guitar in hand on April 20th 2005, and was naturally a little rusty, and obviously nervous. As Bob Chiswick, the announcer, walks on stage and says two words, ‘Jonathan Kelly’ the crowd is on their feet, making more noise at the beginning of a show than many star returns get when they have finished. Needless to say the concert was great success, and a sizeable donation of cash was given to charity. A CD of the concert was released and was available through the website run by Gerald Sable (ably assisted by Rosy), so that those people who were not able to attend the concert were able to get a slice of the excitement and joy that went with the concert. Now at last there is a full length DVD of the event. All sign of any nerves drop away after one bar of the opening song ‘We Are The People’; a wonderful choice to open with as it is a great anthem to bring everybody together. ‘We Are The People’ is one of eight songs from ‘Twice Around The Houses’ including a storming version of ‘The Ballad Of Cursed Anna’. There are two songs from ‘Wait Till They Change the Backdrop’, a couple of old singles and B-Sides, with ‘Mrs. Gilbert’, an anti-war song that is as relevant now as it was over thirty years ago when it was written. It also has two new songs that are not on the CD release: ‘The Best Of Times’ and Peels Of Thunder’, which go to prove that Jonathan Kelly has lost none of his song writing talent or bite. Then a blast through Howlin’ Wolf’s ‘Sittin’ On Top Of The World’, which segues into the rockin’ ‘Train Song’ that brings things to a glorious conclusion. The crowd also plays their part by singing along to all the songs and providing the rhythm section by clapping in time to each song, even the new ones. Three of the crowd are pulled out of the audience to perform the backing vocals to ‘Godas’. During the intro to the DVD you also get the chance to hear a new Jonathan Kelly song, ‘It’s What I Am’, and as the credits roll they are played over another new song, ‘Eileen’, which you can download free from the artist’s website. Noticeably, there are no songs from Jonathan Kelly’s latter two albums with RCA. But for my money the best parts are the in-between song banter from the man. Jonathan Kelly has the audience in the palm of his hands as he tells of road stories from days of yore, including little snippets from Eric Clapton, and The Grease Band amongst others. I won’t ruin it by telling any of them. Buy the DVD and find out for yourself.